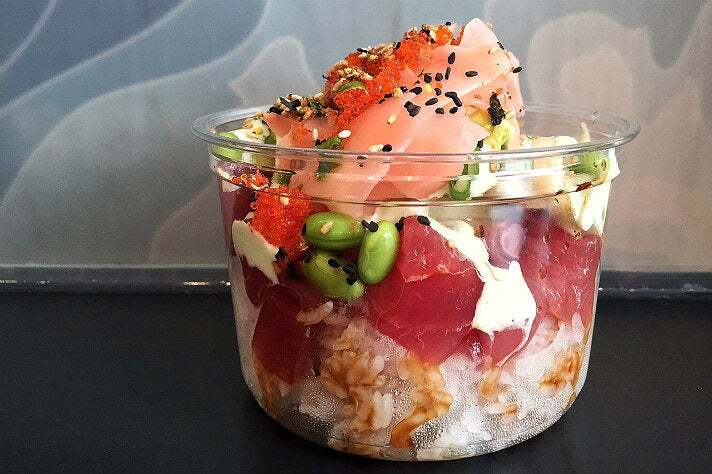 Ask us where our favorite poke place in L.A. is and we'll likely answer "Whichever poke place is closest to you." 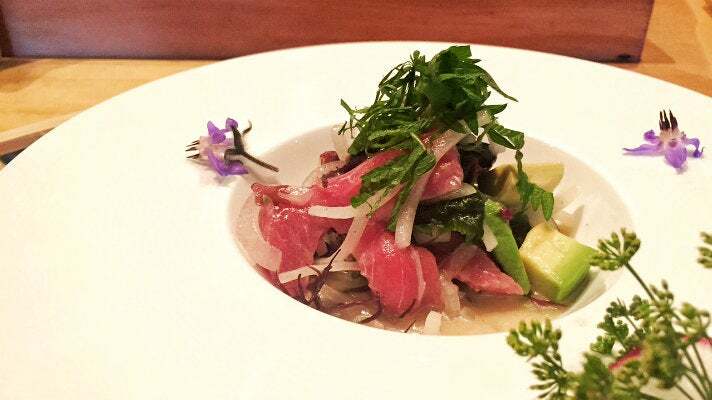 Because at this point, there are versions of Hawaii's take on ceviche in practically every part of the city. Ahi tuna, soy sauce, sesame oil, seaweed and sesame seeds are the constant, along with adding avocado for a few bucks. At newer places you're also likely to find kale, kelp noodles, spicy edamame and coconut flakes tossed in sauces made from sriracha, ponzu or miso. 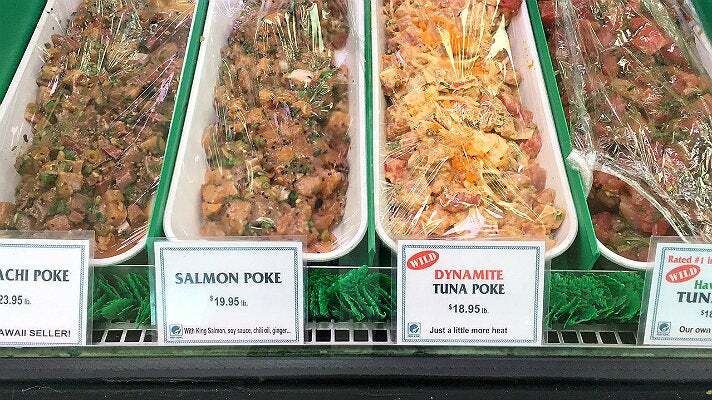 Whether it’s new or old, traditional or modern, there's a poke for everyone. 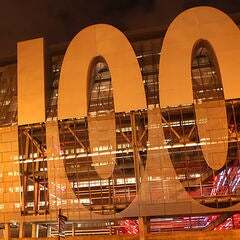 Here are 10 of the best in L.A. 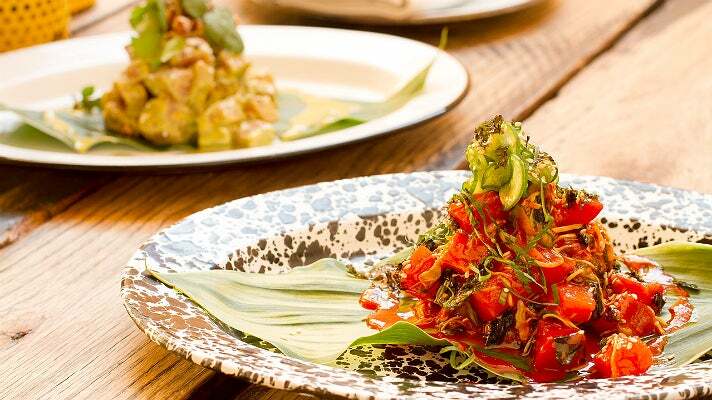 In January 2015, Chef Roy Choi revamped his “urban picnic” concept at A-Frame into a “Hawaiian soul food” menu with L.A. influences. 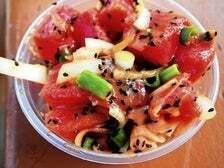 Ask your server for the nightly poke special, which could be anything from ahi tuna dressed in a watermelon citrus or kukui nut pesto, to shrimp in a sweet chili sauce or ono tossed with cucumber. For a truly special high-end poke experience, head to the San Fernando Valley for the poke appetizer at Asanebo. 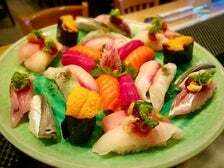 This Studio City sushi institution is known more for its omakase meals than ala carte dishes. But if you go for the latter option, you'll be rewarded with an elegant poke featuring at least three different kinds of seaweed mixed with a ginger dressing, sweet onion, and your choice of tuna, salmon or octopus. 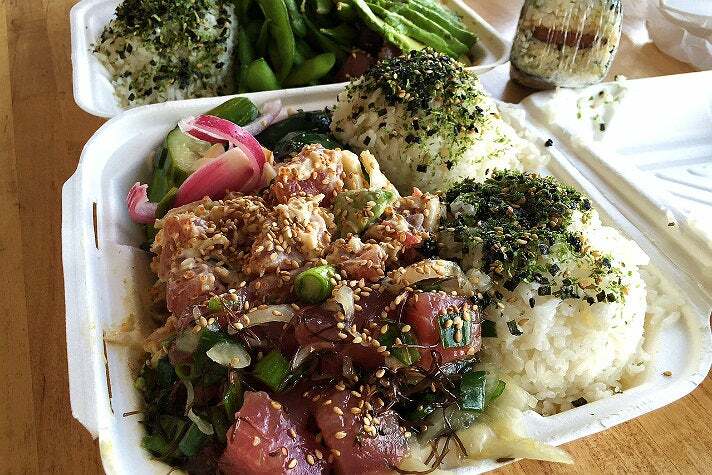 If you like your poke traditional and served by the pound, this old school Glendale fish market is for you. Choose between two tuna options, salmon or hamachi. Or head to their deli counter, where they offer a poke rice bowl featuring just under a half-pound of either tuna option (or both) served over rice and priced at $10.95. Get transported to Hawaii at this Redondo Beach "shack," with its laid-back surfer vibe and furikake topped giant scoops of rice. There's also Spam musubi and cans of Hawaiian Sun to go with any one of five traditional pre-mixed ahi tuna pokes. Sides include your choice of seaweed salad, edamame, potato chips or pickled cucumbers. One thing’s for sure: you won't leave hungry. 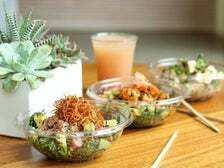 Located on West 3rd Street, this modern shop serves its poke in plastic pint and half-pint containers that are ubiquitous in Hawaii. 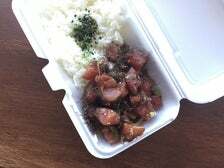 While portions may seem small for the price, what Mainland Poke lacks in size, they more than make up for in fish quality. And they have octopus, which is a fun option you don't see at most of the new poke places. 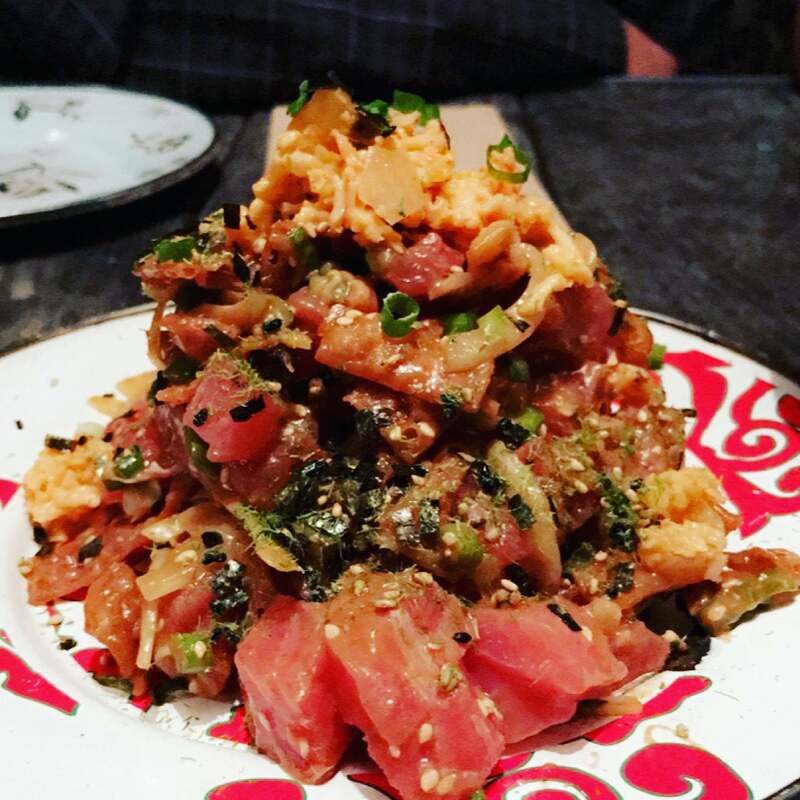 In August 2015, Chef Eric Park relaunched his popular dinner spot, Black Hogg as the second location of his Ohana Poké Co. Now known as Ohana Superette (small Hawaiian grocery store), the all-day menu showcases poké made with sashimi-grade bigeye tuna, Scottish salmon, Spanish octopus, black tiger prawns and organic tofu. Ordering starts with a base of white or brown heirloom rice; then poké options such as traditional Ohana Shoyu Tuna, Spicy Tuna, vegan Soy Ginger Tofu; and finally a choice of side, including wakame seaweed salad, kimchi cucumbers, or ponzu glass noodles. 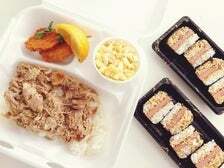 You can also order poké a la carte in half-pound and one-pound portions and go to town with island chips. Calling this seafood crudo grain bowl, served for lunch at Orsa & Winston, a poke is admittedly a stretch. For starters, the base supplements rice with a mix of barley, quinoa, and farro. 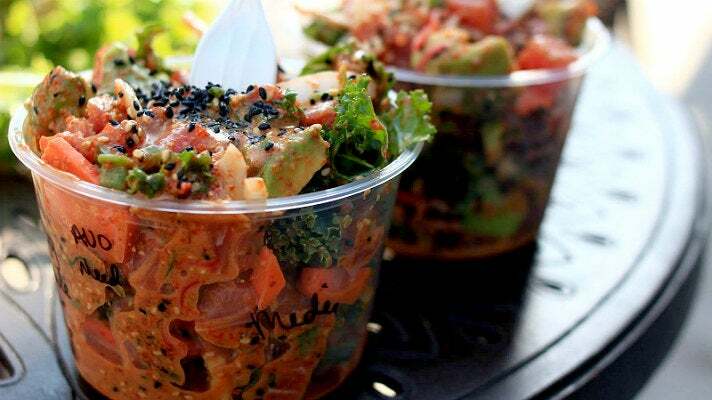 And it's then topped with herbage that you aren't likely to see served at any other poke house from here to Hawaii. 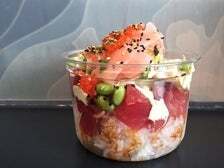 But the cubes of fish, usually ahi or hamachi, get tossed with white soy, Calabrian chile and a pinch of Baco aioli in a way that could only be described as “poke-ish.” The $14 bowls don't really look that much different than some of the more gourmet options described as pokes these days. 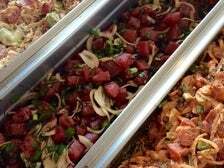 For a true taste of Hawaiian poke, head to this tiny, mostly takeout storefront in Carson, where pre-mixed tuna, salmon and octopus poke are served by the pound or over rice. There are also Hawaiian cooked specialities like kalua pork, loco moco and lau lau. It's one of the only places in these parts where you'll find the super-traditional limu seaweed poke. In 2014, any mention of Hawaiian poke would have inevitably led you to this little takeout window on the Venice boardwalk. 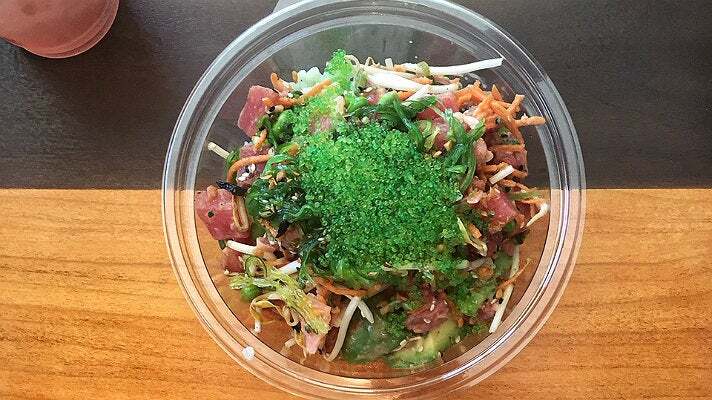 Poke-Poke has been serving green onion and sesame seed topped ahi tuna tossed in shoyu and sesame oil since November 2010. And even though they're no longer the only ones adding kale to your ono treat, they've still got the shortest walk to the beach. 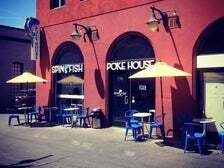 Located just off the strip in Old Town Pasadena, Spinfish Poke House also has locations in Little Tokyo, La Canada and Santa Monica. 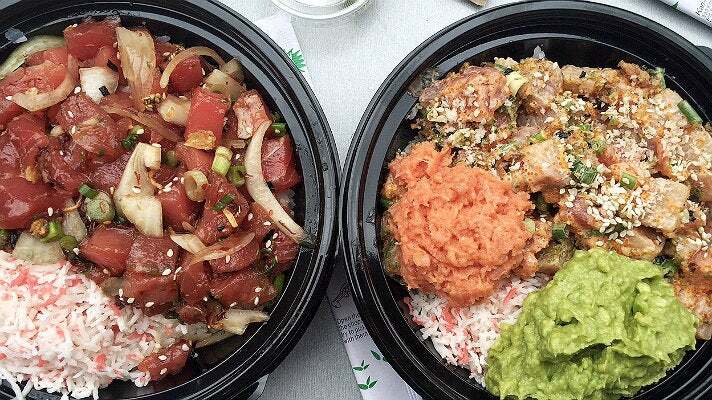 Spinfish features nine different signature poke flavors that get mixed while you watch. And if you choose to build your own, you'll want to take advantage of the long row of jarred toppings like crispy onions, furikake, panko and ogo seaweed. 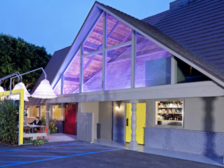 At peak poke times the lines can get long at this Santa Monica hotspot, with Sweetfin locations in DTLA, Silver Lake, Larchmont, and Westwood Village. 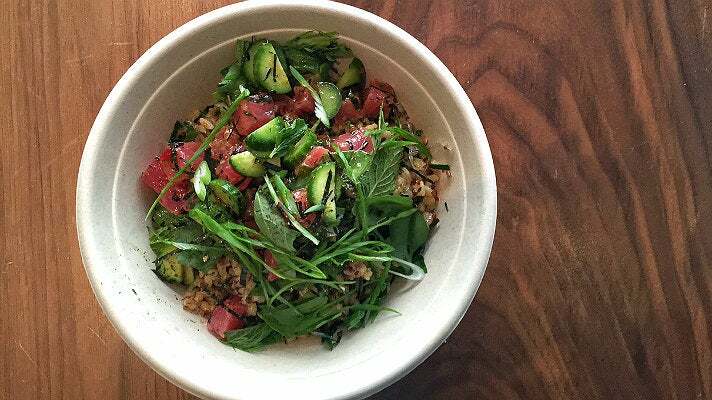 But if you're willing to wait, you'll be rewarded with one of the best of the new school bowls in L.A. Choose from one of their signature creations, or build your own with tuna, snapper, salmon or tofu. It can get a bit pricey if you're looking for a filling lunch, but they've got a long list of unique toppings like crispy onions, wasabi coconut, shiso and chile-marinated oranges. Of course there's also kale. Instead of rice you can substitute kelp noodle salad. Whether it's the longtime Downtown L.A. location or the more recent sequel in Santa Monica, Water Grill is renowned as one of L.A.'s top seafood dining experiences. 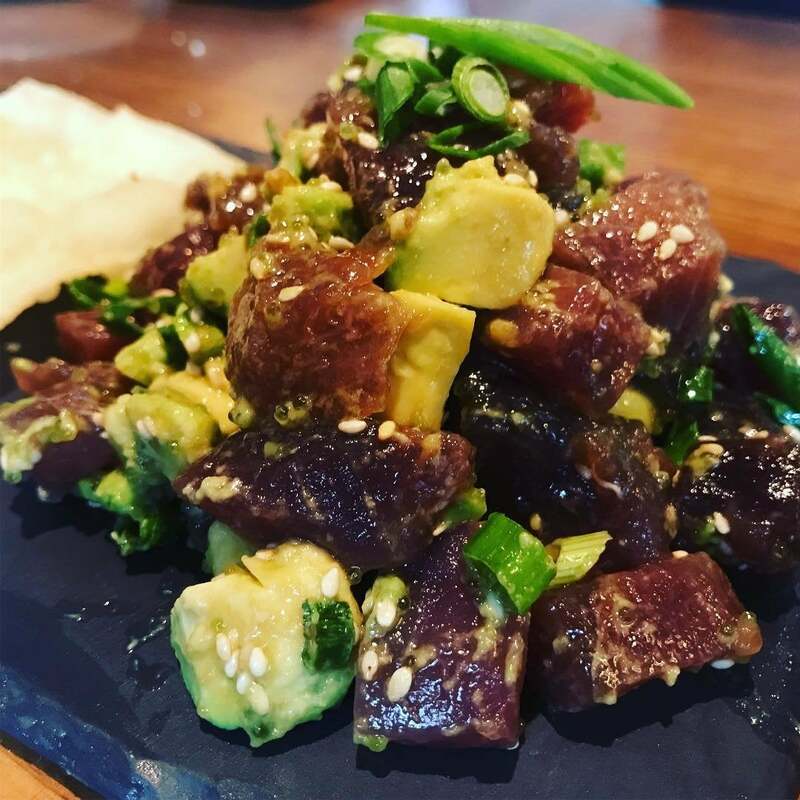 Available as a lunch or dinner appetizer, Water Grill's upscale take on poke is made with wild Indian Ocean bigeye tuna, soy sauce, avocado, wasabi tobiko and sesame seeds.